Perhaps because we in the South have been having one of the more intensely cold and icy winters in recent memory, my thoughts have turned of late to the Canadian Arctic. Of course, my fascination with that region pre-dates the latest cold spell but the current chilliness causes me to contemplate in a more direct way the far north regions and what difficult living that must be. So, about a month ago I read through Inuksuit: Silent Messengers of the North by Norman Hallendy, which clued me into the mysterious man-made rock structures called inuksuk (the plural being inuksuit) and the special role they play in keeping people connected with one another and spiritual forces across the vast and barren — and hauntingly beautiful — landscape. 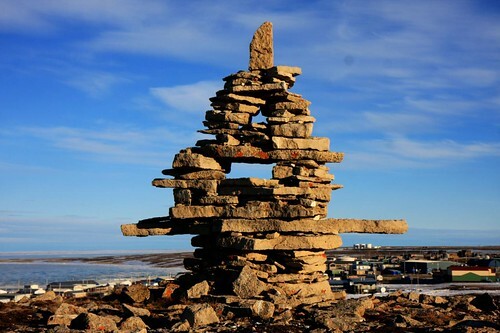 Hallendy came to understand the intricate language and significations of inuksuit among the Inuit people over the course of his more than 40 years visiting the Canadian Arctic. His book does a wonderful job allowing us to peek into the lives of the Inuit and their reverence for the natural world.